I don’t write much about running a business on this blog, though it’s something I’m looking to change in 2017. So why not start now? One of the conversations several of my friends and I have been discussing is finding quality people to employ (and this can be via contracting, full-time, part-time, whatever). And each of us – like any other business – have our criteria. A topic that has come up is the stigma that’s attached to the idea of a “senior developer” or a “senior” anything for that matter. I have two contractors. One is a developer. One is an implementer. It suits the needs of the business perfectly. I have, like any organization who wants to be on the up and up with their taxes , a CPA. I also have a part-time person who helps me keep my books. My role has changed into both software development and business management (and I’m still figuring out how to do that – thank God for people who have wisdom they are willing to share). The way in which we all run our businesses vary (and some of these firms include Reaktiv, Sandhills, Zao, and MemberUp), but there are a few things that are common in a recent discussion: What is a senior developer in WordPress? First, I think it’s important to read this article that Josh shared (which he got from Rachel). It makes some really good points all of which I believe are applicable to any senior position. And yeah, it all sounds good and perhaps even easy. But if it were, would there be a need for such an article? I digress on that point. But when it comes to senior development, I think it can vary a bit from company to company. Familiarity with object-oriented programming principles and the foundational WordPress APIs (or know where to look to find them). Self-disciplined enough to be given a task and then to be able to solve the problem by breaking it down into more manageable tasks (divide and conquer, etc.). Willingness (if it’s not already in place) to learn to branch, to merge, and to deploy to staging, small feedback loops, and iterating before even touching production. Able to be autonomous in their work. That is, a job comes in, and that person is selected to be the lead on the job, then I expect them to embrace the “lead” aspect of it fully. The desire to fully understand the problems they are solving versus looking for a solution, copying and pasting it, and then moving on to the next task. Sure, there are a few more, but those are the big ones. In fact, I’ve asked my latest contractor for projects in which he’s the lead if he’d embrace the leadership aspect to the point where he tells me which tools he’d like to use and the rationale as to why. The reason for this is because I recognize that after ten years of working in the industry, there are going to be things the generation behind me are going to be familiar with that I’m not. And this is exactly is how we were ten years ago, right? We knew things our superiors didn’t and not being heard when there was a simpler solution is frustrating. That’s not the kind of business I want to run. On the flipside, being involved in the industry for a bit longer than those who are younger give us the ability to provide mutually beneficial advice that can help them bypass mistakes we’ve made. I think they call that wisdom (though I don’t know if I’d consider myself wise ). 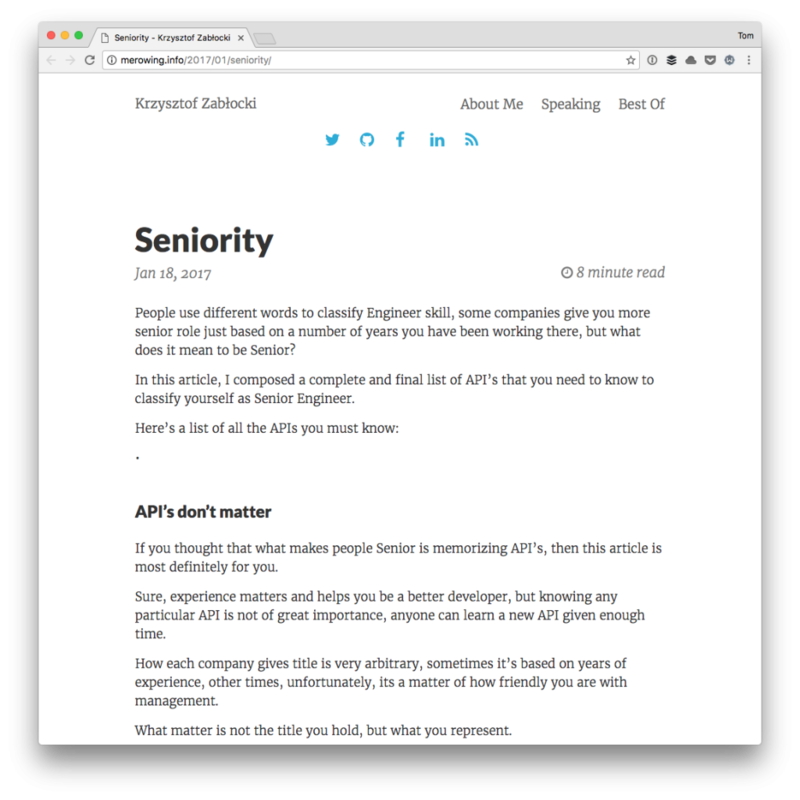 What is Seniority in WordPress Development? With all of that said, the skills that I think are worth having as a senior developer in WordPress are listed above. But do titles really matter? 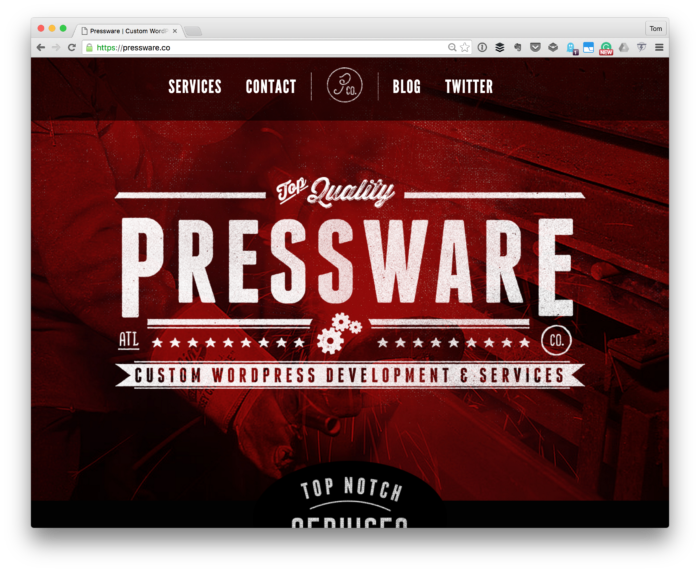 For Pressware, no. At least not where the company is today. But I get it when it comes to other organizations and I think it’s needed. For now, I’m more concerned with one’s personality and one’s ability. A person’s ability and quality, personality, and drive to build good software does that. That’s why you don’t see titles discussed or listed on the things we do. But if you’re running a business, and you’re looking to hire someone at a senior level, perhaps one of the best things to do is find out where the stand with some of the aforementioned points either in the linked article or the points above. I’m not saying I’m right. I’m not saying my ideas are universally applicable. Perhaps they could stand to be improved. But the point that I’m trying to make is this: It’s important to define what you look for in your senior developer in WordPress then pursue that. Mention the title or not – doing so may negatively or positively influence the return you have on your search. I’ve heard both sides of the story, to be honest. Have a vetting process in place and then, for those who seem to be a good fit, pursue them as hires. Regardless, one’s ability to handle problem-solving is absolutely key when it comes to being a senior developer in WordPress (and perhaps a senior developer in anything). My father ran a very successful business for 40 years only to lose everything because he refused to evolve and keep pace with competitors that had embraced digital automation. This was the late 80s and a bit of an extreme example, but the point is humans tend to be creatures of habit – we like to go with what we know and if it’s not broke don’t fix it. It’s the difficulty of “letting go of your baby”, wether it is a piece of software, a business process, that IDE or library you’ve been using since forever, or an actual baby (my daughter will be going to college in a year). Resistance is futile. Evolution in the industry is a very difficult matter to try and vision these days for several reasons. The quality of some of the more recent Open Source projects for example. Will they get traction? 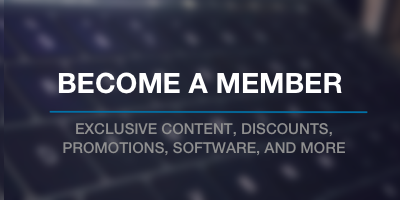 Is a person educated and gaining the experience to properly leverage them as they turn into revenue roses? We did not need to even worry as “indie’s” where the industry was going per se, there was always a market someplace. That is changing. Due to the speed of evolution of software technologies these days its hard to set a course that is obtainable if one needs be agile to transition. For example. Take PHP. PHP 7 provided performance increases that were important. But here in the community where I live which is very tech oriented and in fact in the 80’s / 90’s used to be considered “The” tech center on the Eastern seaboard (USA) evening saying the word “PHP” for new sized projects in industry is like belching at a $1500 a plate dinner. Where Symfony, Code Igniter were staple frameworks they are now dismissed. Why? What is happening or happened? Numerous things. The steady march towards digital device unification being one. Scant years back the “responsive” term came to play and everywhere “responsive” was everyplace. Flex and that which comes after it will kill what was deemed “responsive CSS frameworks”. But device unification is much more than the physical device. Its the transport mechanisms which most at this point are proprietary. These are the mechanisms by which large complex data sets are dynamically compressed, sent, received, decompressed and used and/or executed. Most of these are coming from the commercial video game development houses. As an example. A friend I have known for over 30 years now works for Bethesda Softworks. He was picked up to work on Morrowind and has had his hand in on every “Elder Scrolls” game since. He tried for sake of trying to implement one of the transport protocols via a Apache extension and using PHP to operate and/or execute the dynamic objects. Its a no go. The performance simply is not there. Yet, all of these are the future. As the operating systems move into the cloud which both Microsoft, Apple and yes, even Google are working towards everything changes. I am in an odd position for example. Not new to coding, well versed in Assembler, C++, C#, VB, .NET now working on some WP/PHP stuff. My first plugin began a bit over 70 days back now. The skill set I need for the future I have but no idea WHERE that future is per se. A whole lot of the Web / Unification is going to be gobbled up by the likes of Amazon, Adobe, Google, Microsoft and others. All these entities saw the writing on the walls back 10 years ago. Amazon’s computing infrastructure .vs. its hard/soft goods sales venue. In shopping, for example, its going to become much more “VR” than the traditional shopping cart. I have saw it. Its amazing. But, scary. Scary in that things like Magento, Woo, PrestaShop et al appear as DOS .vs. Windows. So where will consumers shop with their tablet, phone, watch, game system (portable or not), or their smart client notebook/desktop machine? It is at least presently impossible for Magento, Woo, Presta etc. to perform “VR” shopping as the language doesnt have the Umph. It cant manage at least as of PHP 7 to adequately respond to the transport more or less processing thereof. As a WP developer I am “late” to the market. As we can all see, creating theme’s for example is rapidly becoming moot. Drag/Drop theming is the new today and as they get better will end standalone theme’s. Plugin’s may well go the same way. The future of software engineering is drag/drop assemblies, setting associations, parameters, etc. but thats many years off. In applications, not so far off. Now, lets say years pass… Have been able to keep food on the table but storing away what is needed to retire continues to be less and less. Now your 40. The world is changing. Contrary to belief, all products wane. Eventually WP will be usurped. Perhaps its Amazon or Adobe or Google or some spectacular .NET/Mono gig and device unification is the blurb of the times. At 40, all of a sudden “Sr. WP Developer” does not work. Literally. One is aged out of the job market and the relied upon platform is in the wane. Said, “wax and wane” is occuring far far faster than only 20 years ago due to the march ahead. What is causing said march these days? Many things beyond scope of this post from the enormous steps ahead by video gaming industried to mobile, need of regulatory abilities on and on. The point all being… As indie’s there is no such thing as stability in running one’s own engineering business. I’ve went through this over and over in life having written code since 1978. Running one’s own show takes more time than working for someone else. Is it more satisfying? Yes and no. Yes day to day. Not so much when one considers, “Ok. Job done. Did I get a raise for my good work? Nope. Glory? Yes! But that is fleeting.” Unto the next job. It requires more thought and responsibility, running one’s own show. One may well be making more than they’d make working in corporate/commercial. Are they? By the time benefits factor in? 401K? Stock or profit sharing? My brother hates where he works. But, he also has lots of shares of their stock he began buying day 1. He’s worth over 8 million dollars in stock and keeps balance there. He sells some, banks money or invests elsewhere in stables. He has no degree’s. Rather than stay indie (like I did) he went the other way. Since he has worked for AOL, eHarmony, etc. etc. he has no credentials problems. If he wants work someplace else, he does. In compare, me, indie, there is no way even in saying, “I have made my own way for 30 years” even get a shot at jobs he can acquire. Thats true. But year after year that marches by his credentials TO work in that industry are lessened. At SOME POINT things “time out.” That is to say, what is relied on for staple money moves. I did wonderful, video games, then the PS/2 and original X-Box hit and in 3 years time everything changed. The credentials I’d made over 15 years became LITERALLY completely worthless. Why? Because Bethesda or RockStar or Infinity Ward was not on my resume. Just as if I worked on say WP for 20 years and then it waned, replaced by newer mousetraps. When I go look for employment and say, “Well I did this/that with WP for NY Times and Washington Post and this and that… as a contractor” it becomes completely moot. Employers want skill set that is “Today” and at an age they can mold. “Self employed” now in the software engineering industry doesnt go over well. Most employers are not interested in someone who has done this in SW engineering. They look at it as a problem, not a asset. So if I had words of advice? What would they be? I would say, get the money fast as you can and stick it away in something tangible, Gold for example and some decent investments. I mean real money. Not $100,000 a year and live with that. If you have the skils to create a best-seller plugin, do it. Even if that is not what you want do. “The ship is ALWAYS sailing AWAY.” is the mindset towards retirement. If its, “Well next year I plan…” thats too short visioned. Get the gold while its there to be had, then one can think about what they would like to do. The gold will not always be there, not in this technology. Not only in the sense of, “well that does not fit, its a square plug for a round hole now.” but also towards credentials, it now makes the developer appear obsolete both in skills and AGE. I’ve lived it and know many many others who have. In fact, it appears to be a standard cycle. My brother stepped back into it. Hired as a lead developer for League Of Legends. Had been years since he’d done video games. He left after a year. He wants me do mobile games. If one makes a .99 cent game, sells to less than 1% of the mobile market. One retires 20 times over. We’ve had talks. Not just towards work but retirement. There lay the problem in being independent. Trying to predict that which one cant control and being unable or even able to transition to it. Even if one can transition skill set do the credentials have any weight? Will my age and such work against me? The hard part is trying to know all this. How can one predict what has not happened? One cant. But one can see the signs. If one see’s the signs then thats the time to start change, otherwise, too late. None of this am I saying to discourage anyone. Running one’s own show can be fulfilling. One doesnt feel like a robot in a system. But in software engineering/platforms its important IMHO and experience if one does run their own show that they need be MORE than they tend thing they need be. Usually, they are quite focused. That focus keeps the eyeballs and head off the target. The target is not next week, next year. The target is many many years off. Its like having a business where you collect a specific flower and sell them. You happen to have found wonderful ways of getting them and yours are sought. You pick them and sell them and pick them and sell them. All seems grrreat. No worries. Making plenty of dough, more than I ever would working at the garden factory. Then, the market wanes. A new flower is sought and in order to get them, re-education and your prior expertise is not of consequence. The new flower is harder to get to, your older, it requires climbing cliff’s. OR… Some companies replace your flower, they make them cheaper and thats all people care about cost and the flower. You’ve heard it said, “Older makes for wiser.” Keyword here in software engineering is its retrospective. ALWAYS. As an indie need be literally drunk for getting money and dont spend it. The EXACT SAME LIFE PARADIGM EXISTS whether working for a business or running ones own. People work for whatall, Google because its a steady paycheck and they look towards future. Most would rather work for themselves IF the paycheck were guaranteed to meet or exceed Google and benefits, stability of job as well. In retrospect, at 54 years old if I could turn back the clock I’d not run my own show. From stress to constant thinking to on and on… My brother, three years older. He does what he wants to do when he wants to. If he wants not work all next year, he does that. He’s fumbled about in real-estate, makes more money. Running one’s own show IMHO means get as much money as you can get. Now. The vision for that money comes down many many years away, just like working for someone else. Anything other than that means one is taking an enormous risk with their life. Now, I dont have kids or any responsibilities like that. Fortunately. If I did, that adds another layer completely atop things as they count on me. That said, there are some principles banks use. Small business means 1.2 – 3 million gross revenues per year for them to consider said business viable towards future success, SBA loans, Governmental work, being able to afford potential libel representation, surviving a adverse event etc. Anything less than that they consider high risk of failure. All things to consider. Bang, car accident. Cant work for a year. “No I can always write code! Even in a bid if I have to!” Well, no… Because there is a TBI, nerve damage, expense, family, co-pays. Example: My fiance’ has MS. Her med, $55,000 a year, 2 pills daily. Did she plan on MS? Nope. Can your business absorb $4300 a month? Can it absorb a best case health insurance plan? Long term? Today is not like just 35 years ago when I exited high school. Much has changed. The poster above notes, we can be creatures of habit and he is very right. Back then, a whole lot was easier. Were not gobs of coders. It was an exciting time to live in the technology. Now, different world where gold is not around every turn in technology for an indie. In fact, its flipped. There is more long term danger of survival than ever. While doing one’s own thing feels good after 30+ years not so much.